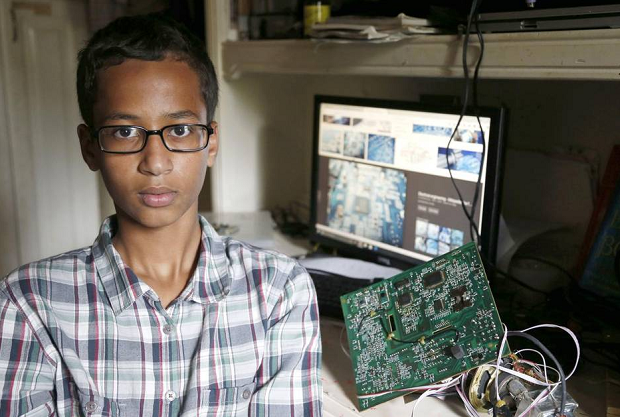 Thankfully, Texas police have decided not to charge a 14-year-old Muslim boy wrongfully arrested for bringing a homemade clock to school. Officials at MacArthur High School in Irving alerted police because they thought the device was a “hoax bomb”. 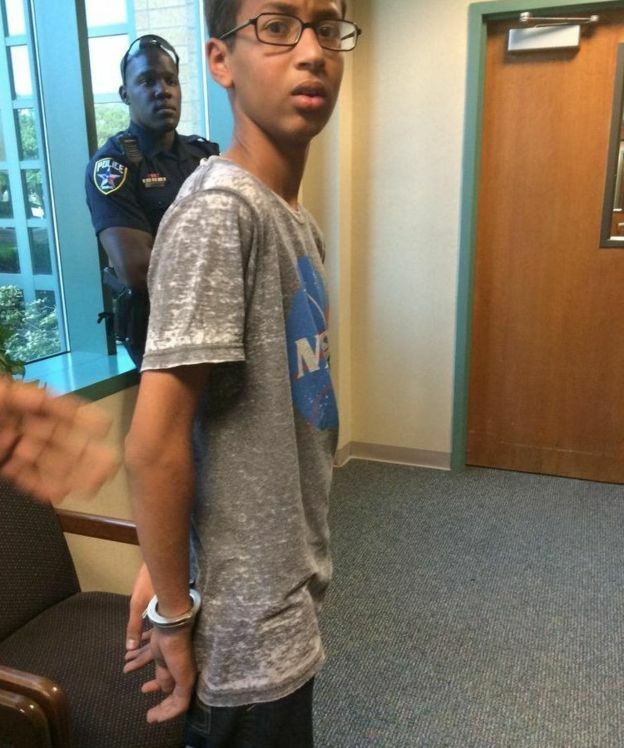 Ahmed told reporters it was “very sad” that his teacher thought his clock was a threat. Ahmed’s father Mohamed Elhassan Mohamed, who is originally from Sudan, praised his son’s ingenuity, saying he fixes everything around the house, including his father’s phone and computer. “He’s a very smart, brilliant boy and he said he just wanted to show himself to the world,” he said. As I’m sure you can imagine, the way Ahmed has been treated has outraged many people. 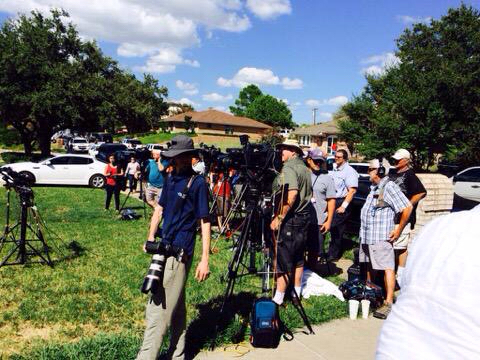 However, it’s was so heart-warming to watch Ahmed’s family respond to the media camped outside their home. 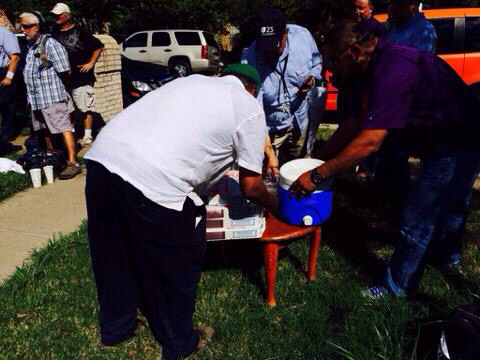 Rather than telling them to leave….his parents led by example and fed them. of his son’s humiliation after he had been handcuffed in front of his classmates. But Mohamed said he’s also been touched by the outpouring of support for his son. “What is happening is touching the heart of everyone with children,” he said. 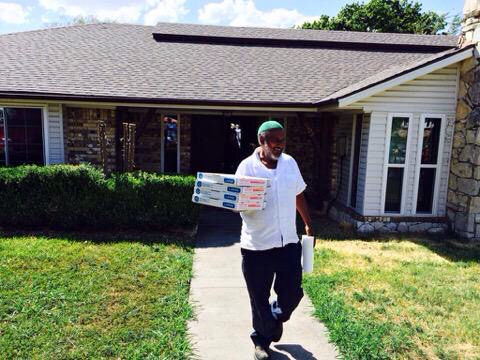 Even in the face of unwanted attention and an unkindness done to their son, Ahmed’s family practiced Kindness, Forgiveness, Generosity and Hospitality. I have tears spilling out of my eyes reading this. So sad for the poor child but so happy it all turned out so well in the end! Inspiring ….. even hen facing this situation, these “Muslims” are nice. Lessons to learn? I think so …. America! This young man has smarts and class. It’s quite shameful how his school has responded. They need to apologise, not cover their mistake by justifying it. I wonder how his classmates will respond, especially with that teacher. Will they lose respect for her? Way to go, Zuckerberg, Obama, the Mohamed family, and so many others for helping a 14-year-old boy learn the true lessons to be learned from such a terrible incident. Kindness and compassion can make all the difference. In a time when children of color are at higher risk from poverty, war and violence, we can not continue to justify prejudice by defining it. If previous actions unrelated to a person in question paints your impressions and if you fear one you come in contact with because of actions of another, you are demonstrating the act of pre-judging. Bright, promising children are being treated like criminals right where you are and it is both sad and applauding. In the spirit of the great lions: We must protect the pride. of hate in trying to see this as a racist issue though, by your own making, folks… Also, Judaism and Jewish are missing categories, yet you include Islam and Christianity. Do I see your biases? Thanks for liking my post about all the cancer and deaths in my family…? I can’t find much here that curates to kindness; just a certain slant and bias. So, thanks, but you don’t own the kindness category, either. Please accept our sincere apologies for offending you. Thank you for your unexpected response. I may write an article about my feelings inspired by this, here. Seeing this has helped me to sum up, I think, what it is that bothers and offends me. Thank you for helping to clarify, via your site, what I find missing. You may have just helped the world understand the way Jewish people might feel. Shalom, Aleha.